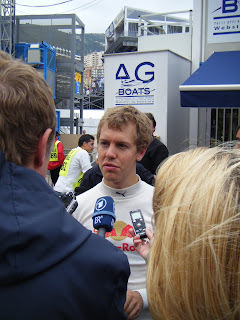 Who or what can stop Sebastian Vettel in 2011? He's making a habit of proving doubters wrong, and of dashing any expectations (or hopes) of his preponderance being challenged. This is exactly what happened in qualifying in Monaco today. Seb had claimed four out of five pole positions so far this season, but today was supposed to be different. The Red Bull wouldn't be able to stretch its legs around the tight Monaco track, and in any case Seb didn't have a great record in the Principality. But Seb did claim pole position today, and by close to half a second from the next challenger. We really should learn not to underestimate him. Vettel is clearly a more rounded and formidable performer than even in his championship year last season. He's addressed many of the areas that were previously seen as relative weaknesses in his make-up, and he demonstrated today that he's now got Monaco licked. His race engineer Guillaume 'Rocky' Rocquelin exclaimed 'tick!' down the radio to Seb after pole was confirmed. Everyone knew exactly what he meant. The theme of the season so far has been that Red Bull's pace advantage in qualifying hasn't translated fully to the races, for a variety of reasons, but Seb's advantage of track position at the front has usually been enough to deliver the race win. This is likely to be the theme in tomorrow's race as well, assuming Seb can retain the lead off the line. The drivers behind and their teams will be scratching their heads as to how Seb can be leapfrogged. Barring the abnormal happening it's hard to see an overtake, so that leaves strategy. Two stops are most likely, certainly for the front-runners, though the hopes/fears of the super softs adding a random element by wearing quickly have receded somewhat (Seb completed a 17 lap run on them in practice, and retained a consistent lap time when doing so). Tomorrow's Grand Prix may be more in the style of 2010 and previous, rather than the topsy-turvy 2011-type brand. Nevertheless, Seb said after qualifying that he expects 'a bit of a casino' in tomorrow's race. Assuming he's not referring to the local landmarks, does he know something the rest of us don't? The other big story of qualifying was a big accident involving Sergio Perez in the final session. Most onlookers feared the worst after the accident of some violence, Perez losing the car over a bump in the run out of the tunnel down to the chicane, striking the end of the barrier lining the subsequent straight. Fears were particularly acute given the initial lack of movement from Sergio himself, as well as that the smash was eerily reminiscent of the one at the same spot that injured Karl Wendlinger so badly in 1994. Fortunately, Perez's injuries are minor (concussion and a sprained thigh). So, while we may not see him in the race tomorrow, he'll be back behind the wheel before long. The accident had a knock-on effect of giving a rather mixed-up top 10 on the gird, with many drivers out of position. This is because the red flag for Perez's accident was thrown around two and a half minutes before the end on the final session, at which point many hadn't maximised their efforts (and indeed Hamilton hadn't set a time at all). While there was time to get another run in, the momentum and rhythm lost from the long delay meant that improvement to lap times was almost non-existent. Lewis, having looked a strong contender for pole for the most part, will start down in tenth having his only time (good for seventh) deleted after cutting the chicane in setting it. It demonstrated the risk of only going for a single flying lap in the last qualifying session. Ferrari's pace seen in practice seemed to evaporate somewhat in qualifying. Alonso will start fourth, not even matching his best time from practice. In fairness to them, they appeared to be going for longer runs in the first two qualifying sessions, and aimed to do a second run in the final session without refuelling, when the red flag scuppered them. Alonso will likely have strong race pace, but, as with Lewis, and as is usually the case at Monaco, a lot will depend on clearing traffic (especially Mark Webber, who starts third). Seb's most likely challenger tomorrow is Jenson Button, who lines up alongside him on the front row. Jenson will hope that he'll be able to use McLaren's stronger race pace and superior tyre management to clear the Red Bull, as Lewis so nearly did in Spain last weekend. I suspect the word 'undercut' will be used in tomorrow's proceedings.